If you’re based in Perth and you need banner printing done quickly, then we are your one stop shop. With our super fast large format printers, using both UV curable and solvent ink technology, we have the capacity and the knowledge to churn your banners out quickly, cheaply and efficiently. Seen above is just one of our printers, pumping out metres of material. And because the inks are dried instantly, we can quickly move on to other jobs. Crisp detail, punchy colours, high speed – it’s a winning combination. No, banner printing is extremely economical. In terms of cost per square metre, banner printing is the most cost-effective outdoor advertising method. Billboards cost less than advertising through the Yellow Pages or using an SEO company, yet the amount of people who see it more than pays for itself. And because it’s cheap, you can change your message in a short space of time without throwing money out the window. Remember, banners can be re-used – as long as they’re stored properly – so you can display a previous message quickly and easily. If you need banner printing done, then remember Banners Perth. We’re here to help. 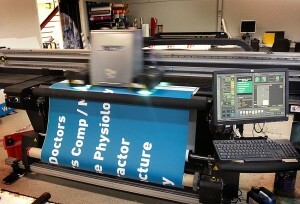 This entry was posted in Banners and tagged Banner Printing Perth by Banners Perth Staff. Bookmark the permalink.